Garbage-based power plant for City. HYDERABAD: The Greater Hyderabad Municipal Corporation (GHMC) has finally entered into an agreement with Venkateshwara Hydro Power Projects (VHPP) for setting up of a 12 MW power plant based on the municipal solid waste. Additional Commissioner S. Aleem Basha (Health & Sanitation) said the government has accorded permission for the plant and as per the agreement signed with the firm on Wednesday, 700 metric tonnes of municipal solid waste per day will be given free of cost. The plant is coming up on a 100 acre sire at Yacharam, near Ibrahimpatnam, Ranga Reddy district, to process, recycle and convert garbage into power by removing hazardous and recyclable material after obtaining necessary permission from the A.P. Pollution Control Board (APPCB). 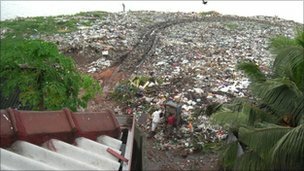 However, the firm will have to pay Rs.25 per ton of garbage supplied to the site as royalty. It also brings to a close a prolonged letter duel between the municipal corporation and the firm for commissioning the plant. For the last couple of years, GHMC has been refusing to enter into a deal on the premise that VHPP did not complete financial closure within the stipulated time. What was unsaid was also the fact that GHMC had signed up with Ramky for an Integrated Municipal Solid Waste Management Project using up the daily garbage being generated in the capital save for the 1,400 metric tonnes of waste to be supplied to Selco and RDF power projects. These two firms had a previous agreement with the civic body and hence were exempt from the Ramky deal.